I've washed my raw Romney for Project Spinway. As usual it seems like I have way more fiber now that it's been washed. 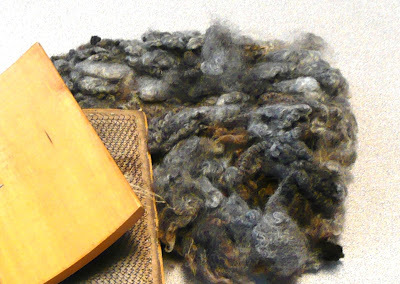 And it's not nearly as brown as I had thought it would be - lots more gray - and lighter in color too that the raw fiber. I washed it twice in a sink full of very hot water and a squirt of dish detergent. Both times the water was very brown - the first time like very very strong black coffee - but not nearly as appealling to the sense of smell. Then I rinsed several times in warm water until the water was clear. It's been so humid here that it was taking forever to dry so I popped it in my convection oven at it's very lowest setting (about 150 degrees F) for a few hours. It's still the wee-est bit damp. I've been carding bits of the Romney and Bruno and making litte sample skeins to determine what I want to do for this "Stash-down With a Purpose" Challenge. Sample skeins and knitted swatch pics in a few days!! !